The Ohio State men’s lacrosse team might have found its new go-to threat on offense. Junior attacker J.T. 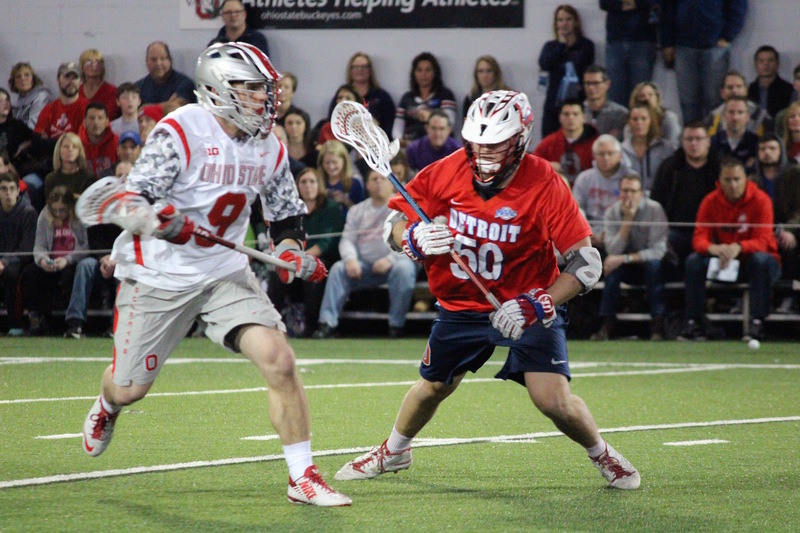 Blubaugh scored four goals and assisted on two more for a total of six points in the Buckeyes’ 16-5 thrashing of the Detroit Titans in their home opener on Saturday. Blubaugh, who in two games this year already has registered half as many goals as his total from last season, led an OSU attack that has somewhat struggled through the preseason and first game of the regular season. However, things look to be turning around. After the losses of scorers Jesse King and David Planning from last year, many wondered who would step up in a leadership role on the offense. Blubaugh thinks he is up to the task. In similar fashion to last week’s game at Furman, OSU found itself in an early deficit. Detroit won the opening faceoff and, after a pushing penalty on the Buckeyes resulted in an extra-man opportunity, senior attacker Andy Hebden threw a strike into the back of the net to give the Titans an early 1-0 lead. Although he wasn’t pleased with his team’s start, OSU coach Nick Myers said he knew the Buckeyes weren’t going to be rattled. And settle right in they did. OSU scored four straight goals to end the quarter, capped by Blubaugh’s first goal after he caused a turnover at midfield and took the ball the rest of the way for the score. Detroit answered back at the start of the second quarter by scoring two goals to cut the deficit to 4-3. OSU was unable to find an opening in the Titan defense in the second quarter until redshirt junior midfielder and co-captain Tyler Pfister took a pass from senior attacker Carter Brown and scored to give the Buckeyes a 5-3 lead. The rest of the game was dominated by the Buckeyes. The offense scored twice more in the second period and 11 more times overall. The Buckeyes made very few unforced turnovers and waited patiently for a good shot. The defense clamped down on the Detroit offense after the first three goals. The Titan offense was only able to manage nine shot attempts in the second half, and a number of turnovers resulted in goals for the Buckeyes. The Scarlet and Gray were able to hold a major advantage in time of possession throughout the whole game, especially in the second half. Blubaugh attributed that to his defense. The defense allowed only five goals on 25 attempted shots by the Titans. The redshirt junior Carey was a big part of that, leading the defense and amassing 10 saves. Myers said he was not surprised by the game Carey had. Another reason for the Buckeyes’ advantage in time of possession was how they were able to win faceoffs. After being named Big Ten Specialist of the Week, junior Jake Withers continued his strong play. A combination of Withers and senior Tae Kim won 17 of 22 faceoffs, leading to many Buckeye opportunities on offense. “Jake’s … been using a couple of different moves and Tae was a nice spark off the bench,” Myers said. OSU will be looking to continue its unbeaten start to the season as it travels to Amherst, Massachusetts, on Feb. 20 to face the University of Massachusetts Middlemen. The game is scheduled to begin at noon.